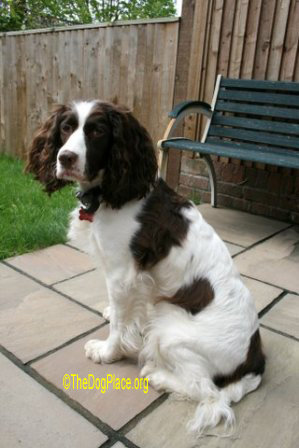 Photos are of Midge before and after surgery to repair the damage the spaniel suffered from repeated unnecessary and unsafe vaccinations. This is Midge before and after surgery to repair the damage she suffered after being jabbed with unnecessary and unsafe vaccines causing an adverse vaccine reaction. We have seen this "shot thing" several times in the US and in the UK. I had a dog die after a Leptospirosis vaccine that was obviously contaminated with something. We never could get Pfizer to deliver the safety microbiological tests that should have been done on the vaccines. 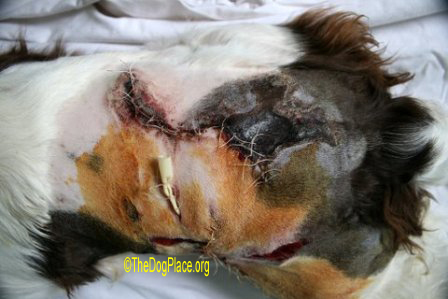 Another dog in NY died because he was overrun with a flesh eating bacterial infection. Necrotizing fasciitis - and it started with the administration of a vaccine, in this case a Pfizer Leptospirosis vaccine. Sadly, the adverse event from vaccination was not recognized. 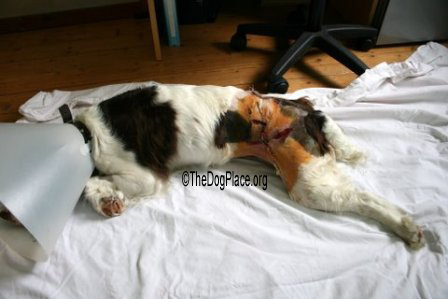 Three different vets saw the dog and administered Baytril, a Bayer product. The veterinarians in Utrecht have found a link to that antibiotic - selecting for necrotizing fasciitis causing bacteria. I have the info on that if you want it but it is pretty technical. 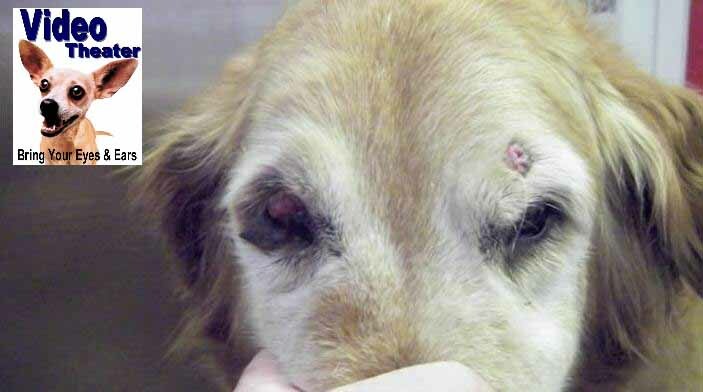 In both Midge's case and the NY case of flesh eating bacteria, both dogs ended up looking like this after having been administered Leptospirosis vaccines that are not even advocated for by our leading veterinary immunologist nor by one of the leading veterinary infectious disease specialists, Dr. Richard Ford. Both of these experts are on record saying they wouldn't give this (Lyme vaccines) to their own dogs despite living in areas where Leptospirosis was endemic. Now, do you think… that the veterinarians waived all the very expensive anesthesia, surgery, medications, exams and rechecks and any tests done on these patients? NO THEY DID NOT. In fact they can't even see that the vaccine did this to the dogs and ADMIT the connection. We (veterinarians) are like people who also end up with vaccine damage - we are at the mercy of the very profession that profits from administering these vaccines and who escapes all responsibility for having administered them. Remember, many vaccines are unsafe and unnecessary to begin with. Luckily Midge lived through this. The NY dog did not. The New York dog's death reminds me why Dr. Ron Schultz warns the veterinary students that they better have a good reason to inject ANYTHING, because any time you do, you can kill. Do you think the public knows this is being told to veterinarians and veterinary students? I would bet not. But there is hope. 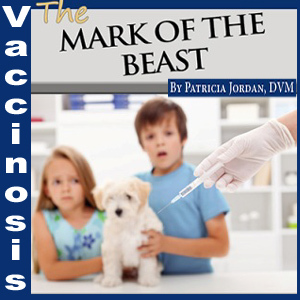 Have the veterinarian do a patient side titer test for the Distemper and the Parvo to show if the dog has neutralizing antibody titer and is protected. Kansas is working on a rabies titer test but until that one is available and accepted in lieu of rabies vaccination, find out if your state has the titer option and have the rabies titer done. Dr. Ron Schultz has been an incredible spokesperson for this. Click for Instant Information on ii Adverse Vaccine Reactions and here is Instant Information on ii 30+ Vaccine Induced Diseases. There are better ways to keep a veterinary practice profitable and ethical. We all need to be honest with owners about over vaccination risk vs. benefit. Not all vets can or want to be specialists in a certain field but all veterinarians should want to take care of the animals. That can be as simple as trimming toe nails, offering dietary advice for the overweight dog, or bathing and grooming service for handicapped or busy clients, etc. 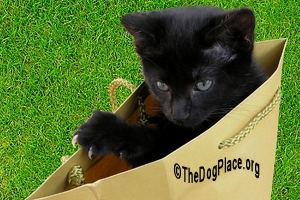 We don't have to jab every dog every time it comes in the door! <<< Stay tuned, literally, click photo to start watching Death By Vaccine Induced Disease in VIDEO Theater, featuring Dr. Patricia Jordan, and also Dr. James L. Busby, DMV who explains why your vet bill is so high and vaccine authority Dr. Ron Schultz explains simple new vaccine titer test that can prevent over-vaccination disease (VID). 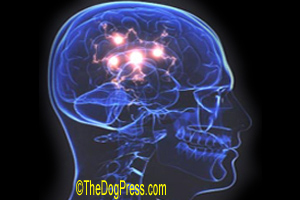 includes autism and six other central nervous system effects in humans and DOGS.